If there's one recipe I really learned to appreciate only recently, it has to be mac & cheese. I had never heard of the dish growing up in France and then only tasted the boxed version in my freshman year of college. This was now a handful of years of ago, and to be honest, I had never really wanted to try it again since. Call it French snobbery, but that processed orangy cheese never suited my palette. After a recent trip to the local farmer's market, I found myself coming back with more cheese than would be healthy to munch on by itself... and a homemade mac & cheese found its way into my kitchen. Topping it with a sweet roasted tomato really brings this over the top. For an indulgent night, it's really quite perfect! Mac and cheese, although one of the quintessential American favourites, beings with one of most classic French sauces- bechamel.This sauce is wonderfully creamy and easy to make. It starts with a classic roux (a mix of butter and flour) which helps thicken the sauce once milk is added. This is also a perfect sauce to use in lasagna as a alternative to tomato sauce. I like to use it when I make vegetarian lasagna, and ladle it in between layers of goat cheese, mushroom, spinach and silky lasagna pasta. In a saucepan, add the butter. When it starts to melt add the flour and stir until the mixture is homogeneous. Add the milk and stir until the mixture starts to thicken (about 4-5 minutes). Add the grated cheese, reserving 1/4 cup to top the macaroni. Once the cheese has started to melt, add the cooked macaroni and stir. Add a good pinch of salt, pepper and the paprika. Transfer to a greased oven-proof dish. Top with the reserved 1/4 cup of cheese and top with the breadcrumbs. Bake for 15-20 minutes or until golden. Remove from the oven and cover with aluminum foil to keep warm. Preheat the oven to 375F. On a parchment or silicon lined baking sheet, lay out the slices of tomato. Season with salt and pepper and the dried oregano. Bake until the tomatoes slightly wrinkle, for about 8-10 minutes. Top the mac & cheese with the tomato slices and serve. Enjoy! I will definitely make this very soon. Mac and Cheese is my favorite comfort food. Even if it's bad, it's good. This looks delicious and so cute with the little pots too! 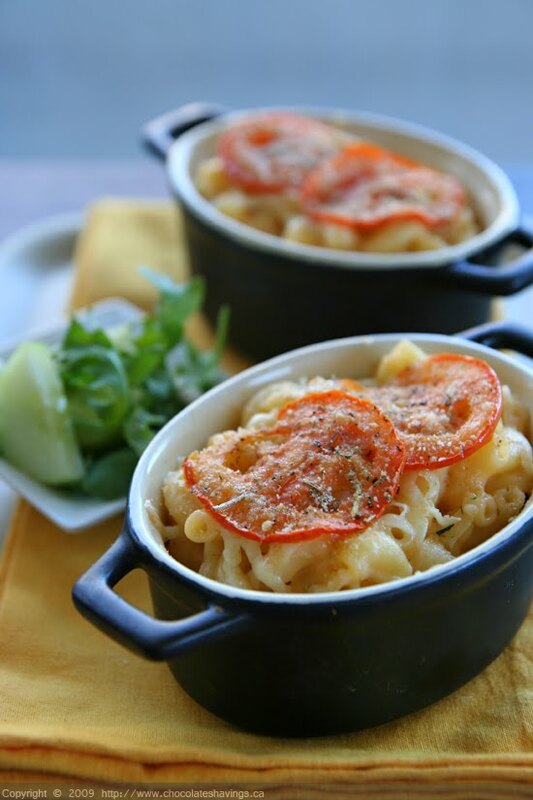 Great idea to add tomato to the Mac & cheese. Mac and Cheese is a very Southern dish. In the summer, Dad adds sliced tomatoes with the bread crumbs on top, too. Sounds like a good mac and cheese! I love how simple and how delicious something like cheese and pasta can be. Seriously? Those look to die for. Who would have though mac and cheese and tomatoes would be such a great mix? Absolutely wonderful! We don't really get that bright orange american cheese here in New Zealand, so I've never looked at it as anything less than exotic. Saying that though, I don't really know what it tastes like, we always just use cheddar. I'm one of those people that find it impossible to follow a recipe without adding a bit of this and that. For mac and cheese, it's usually a vegetable or two or some bits of ham or bacon. A sweet roasted tomato on top sounds lovely too. I love the tomato on top. Yum! WOoh!! This is definitely a kind of food I keep on looking for. I'll try it sooner. Green Market Baking Book Giveaway!